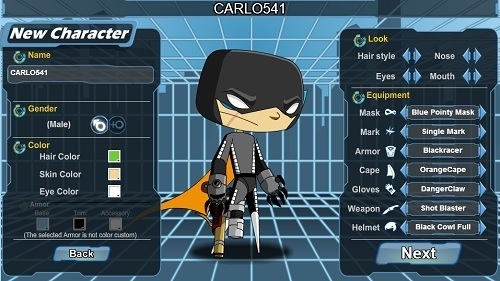 Hero Smash is a browser based experience that lets you play the hero in a MMO environment. 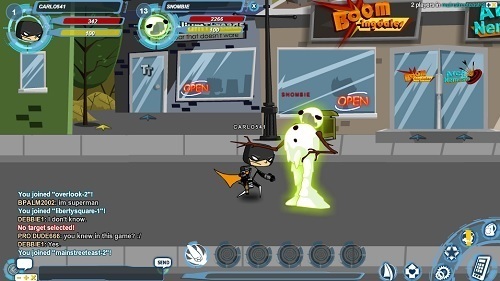 The game was developed by Artix Entertainment who is also behind the hit game of AQWorlds. In Hero Smash you’ll create your own super hero and go about exploring a persistent MMO game world, all within your browser. The creation process is very flexible so you can choose the super powers that appeal to you, giving your super hero its own special feel and potential. Hero Smash also features great co-operative gameplay that uses a real time combat system to keep the game fast paced. Hero Smash allows you to take the side of the villains or heroes although neither side has a particular advantage over the other. Gameplay in Hero Smash revolves around accepting quests from the various NPCs and then adventuring out into the game world to complete them. Most of these missions involve killing a bunch of enemies but there is still a good mix of other mission types to keep you satisfied. As you complete quests you can expect to level up and gain equipment for your character to use just like most other MMORPG experiences. Character growth is fairly well thought out in Hero Smash so you always feel like your growing stronger and that your upgrade decisions have a noticeable impact. For the most part Hero Smash isn’t too different from the other games that Artix Entertainment has put out but the setting is a great change of pace. This similarity also includes children friendly servers (players under 13) where chat is restricted. Artix Entertainment has a great track record with online games and based on what Hero Smash already offers this game won’t be any exception. You can expect countless updates and improvement over the life of the game that will keep you hooked and playing. Free to play browser game. Create your own hero or villain. Customisable skill setups and lots of equipment to use. Child safe servers with restricted game chat. Regular updates means there is always something new.